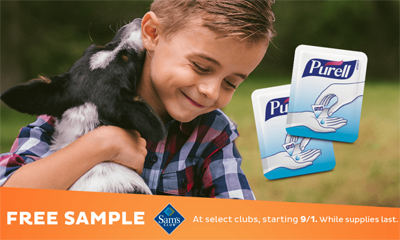 To get a FREE Purell Advanced Hand Sanitizer Sample at Sam’s Club Check the Find a Freeosk page to see if your Sam’s Club is participating. If they are, visit the Freeosk Sample Booth at your store to get FREE Purell Advanced Hand Sanitizer Sample. FREE at select clubs, starting September 1, 2017 while supplies last. You can Also Follow Us On Facebook, Twitter, Pinterest and Google+ for 24 hour freebie updates and more!